The State of Egypt and Al-Azhar University are being the topic of conversation of world calligraphy activists, the article is currently holding an International Calligraphy Exhibition held by Al-Azhar University in Cairo Egypt and attended by dozens of calligraphy artists from more than 50 countries. This exhibition will take place from December 28, 2018 to January 10, 2019. Perhaps the readers have all heard of this calligraphy term. Calligraphy is the art of writing Arabic sentences using various tools and techniques to produce a writing that is very beautiful and of high artistic value. Interestingly, this exhibition is the first calligraphy exhibition held by Al-Azhar. The exhibition aims to make the art of calligraphy increasingly known and popular among Egyptian and International people, while at the same time giving motivation to Al-Azhar students who have an artistic spirit to hone their artistic skills, one of them through calligraphy. The exhibition was opened and attended by ambassadors from several countries, as well as thousands of students, foreign tourists and the Egyptian community. Last August a similar exhibition was also held, but the participants involved other arts as well. The event which lasted quite a long time was also filled with a series of other events, starting from sharing about the world of calligraphy to workshops and exercises in writing calligraphy which will also be provided in this event. So that visitors who want to know the world of deeper calligraphy can immediately discuss with experts. Calligraphy can also be used as decorations and wall decorations, as we can see throughout the magnificent and beautiful mosques in the world. The enthusiasm of the visitors was also very high, seen from the hectic Al-Azhar mosque from morning to night. Visitors who were mostly students enjoyed the beauty seen in each of the paintings. "This is the first time I have seen a calligraphy exhibition of this size, especially by bringing in works from dozens of countries that have techniques and calligraphy writing skills," said -AlAzhar student. "Hopefully an exhibition like this will also be held in Indonesia, so that our young people will channel their hobbies of painting and writing to calligraphy, because besides having high artistic value, calligraphy also brings da'wah messages because what we write is a verse of the Koran," he continued . The good news is that there were five Al-Azhar students from Indonesia who were honored to display their calligraphy works in the exhibition. 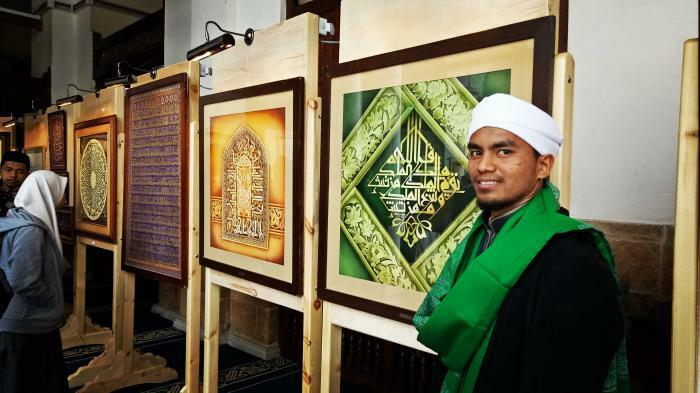 One of them was Jalaluddin, an Indonesian student from North Sumatra who was studying at Al-Azhar University whose two works were on display at the Al-Azhar Mosque. The exhibition was held in the Al-Azhar mosque, where as many as 250 calligraphy works from all over the world were displayed there. Artists also take advantage of this moment as a gathering place with other artists from other countries, and they can also introduce their work to thousands of tourists from dozens of countries who attended the Al-Azhar mosque. The author had a conversation with Jalaluddin, an Al-Azhar student from Indonesia who presented two of his best calligraphy works in the exhibition. "Alhamdulillah, I am very proud to be here, I have started learning khat (calligraphy) since at Pondok Pesantren, but I sharpened it more seriously when I was in Egypt, because here are many teachers and methods that I learned and I am very proud to be one of the Indonesian delegates in this exhibition, "Jalaluddin said when interviewed. "We initially got information from the official Al-Azhar website, then sent our calligraphy works via email, later the selected works will be honored to appear in this exhibition. Alhamdulillah there are five students from Indonesia who also have a place in this exhibition," he said again. Jalaluddin hopes that calligraphy will continue to develop in Indonesia because most of the khat contain verses of the Koran that are very noble, so that by loving you we can love Al-Quran more and more. "We are also generating more calligraphy in Indonesia, because even though there are many calligraphy that can be made with computers, the khat made by hand will be more alive than the computer," he explained. Currently hundreds of calligraphy works are still on display at the Al-Azhar Mosque until the beginning of January. Hopefully the success of the nation's works on display at this exhibition can further enhance Indonesia's name in the international arena. Calligraphy was originally known from the Middle East which was so advanced in its Calligraphy development, that it was not surprising that there were often calligraphy competitions in these Arab countries. Calligraphy usually contains the verses of Al-Quran and Hadith and the words of the previous Ulama. In Indonesia, the art of calligraphy is widely known, as evidenced by the many calligraphy competitions held in various regions and in the world of education, calligraphy has also been taught in public Madrasas or huts throughout Indonesia. This calligraphy is very much available in mosques throughout Indonesia, which are used to decorate the interior of the mosque so that the mosque is made of Islamic nuances and amazes anyone who sees it, this is evidence of the progress and interest of our high society in the art of calligraphy.